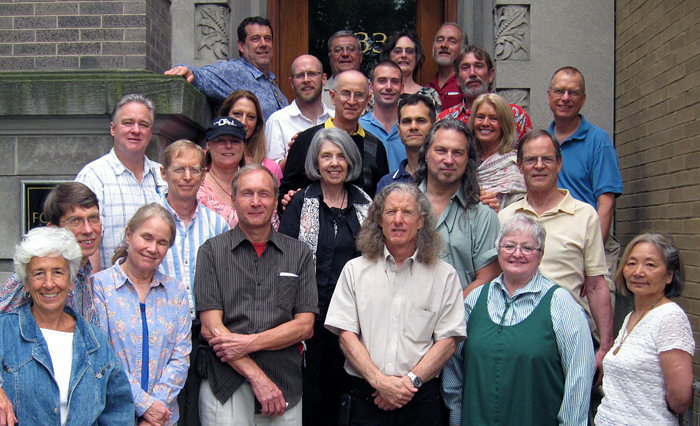 Two dozen study group enthusiasts gathered at Urantia Foundation on June 10-13 for an Appreciative Inquiry session to generate creative initiatives for study groups. Marta Elders led the proceedings, along with Bobbie Dreier and Jeff Wattles. Appreciative Inquiry is a four-part process to help the creativity of a group by emphasizing the strengths and interests of the individuals involved. In the first phase, individuals in pairs interviewed each other on the basis of proposed questions broadly relevant to study groups. Having discovered some of each others peak experiences and strengths, each partner presented his or her partner to the larger group. In the second phase, people reflected on and shared their ideals for study groups (we had groups present humorous skits). In the third phase, based on individuals written statements of their dreams, a few different focuses were distilled, and then people grouped themselves according to their chosen focus in order to design a project to make their shared dream a reality. In the fourth phase, people made commitments to begin their work to actualize the project they had cooperatively designed. Given the time we had and the time that our busy participants have generally it was the group on technology that led the way with projects to accomplish for this fall, while other groups tended to pool their wisdom for the health of study groups. Silent communion for five minutes at the beginning and the end of the meeting proves very helpful to the tone of the meeting and the socializing that follows. Loving service includes providing a place to meet that feels safe and secure. In reaching out to youth, be aware of their accelerated processing of inputs (and shorter attention spans). Promote the expectation that study group members should eventually start their own study group. Discuss your study group mission to refresh motivation toward shared goals (unity, not uniformity). Readers can present a section of the Paper to be studied: Make a presentation, ask questions, or refer to passages elsewhere in the book. Co-leaders steadfast stabilizers are also important. For transformation, let each person select a quotation from each study session to put into practice and report to the group the following meeting. Ongoing projects include Urantia Association Internationals Leadership Symposium next July and Kathy Wanenmakers UAUS project (volunteers, please) to visit every study group and cultivate relationships with each member. The participants were Vicki and Bob Arkens, Bill and Share Beasley, Robert Burns, Linda and Bob Buselli, John Causland, Ann Garner, Tim Hobbs, Nathen Jansen, Robin Jorgensen, Ken Keyser, Chris Lepine, Maurice Migneault, L.P., Aaron Rogers, David Spicer, Phil Taylor, Kathy Wanenmaker, Mike Wood, and Seth Wood. For a copy of the handouts on small group process, study, teaching, and leadership, write to [email protected].